View of the Juan Bautista de Anza National Historic Trail from the north, with Laskey Mesa in the background. For a number of years, Ahmanson Ranch was a controversial piece of land because Washington Mutual Bank wanted to build 3000 homes here, a golf course and shopping plaza. Besides the concerns about congestion from the extra traffic on the 101 freeway and Valley Circle Rd, this area is home to two endangered species. In 2004 the bank instead sold the land to the state for a park and now it is open for riding and hiking. There are a lot of oak trees in this area, but being an ex-ranch, there's not much else growing except grass.The only legal trails for hiking, riding and equestrians are well-maintained fire roads, making this an excellent area for novice riders. Directions: Take the 101 Freeway to Las Virgenes Canyon Rd and turn north to the end of the road. The trailhead for Las Virgenes Canyon is at the end of the road and this provides the quickest access to Ahmanson Ranch from Ventura County. Alternatively, from the San Fernando Valley, turn west onto Victory Blvd from Valley Circle Drive and drive to the end where there is a parking area (and a fee for parking), or turn west onto Vanowen from Valley Circle and go a block. The trailhead is on the left side of the road. This is the main east-west thoroughfare and the easiest way to get to the area from Las Virgenes Canyon. Most of the trail is a fire road except for the eastern-most section in LA County. From the eastern end, the main trail which starts off as a doubletrack from Vanowen St and becomes a fireroad when you transition to Ventura County. 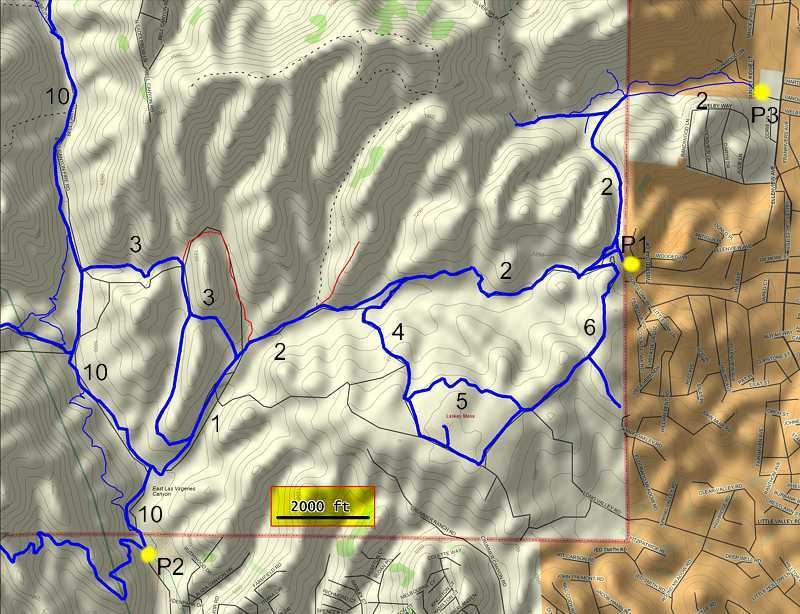 Tthere are a number of singletracks that crisscross north of the main trail. One of them leads to a cave, seen in the background of the picture to the right. 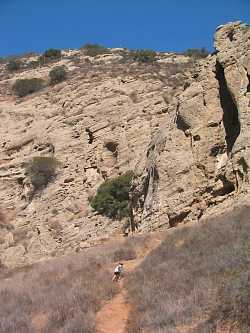 This is a second way to get into the area from Las Virgenes Canyon, although the trail is a little steeper than East Las Virgenes Canyon Rd , so this way in is a little more difficult. 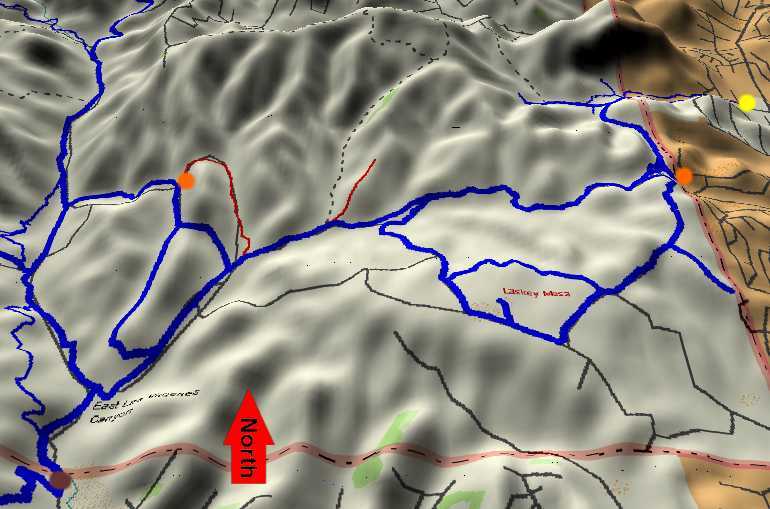 The prefered direction to travel these roads when biking is as shown in the profile below, namely, start up the Ahmanson Ranch House Trail, follow the Mary Wiesbrock Loop Trail (the north branch is a little shorter and has only 80 feet of climbing and descent), then descend the Laskey Mesa Trail (photo shown at right).